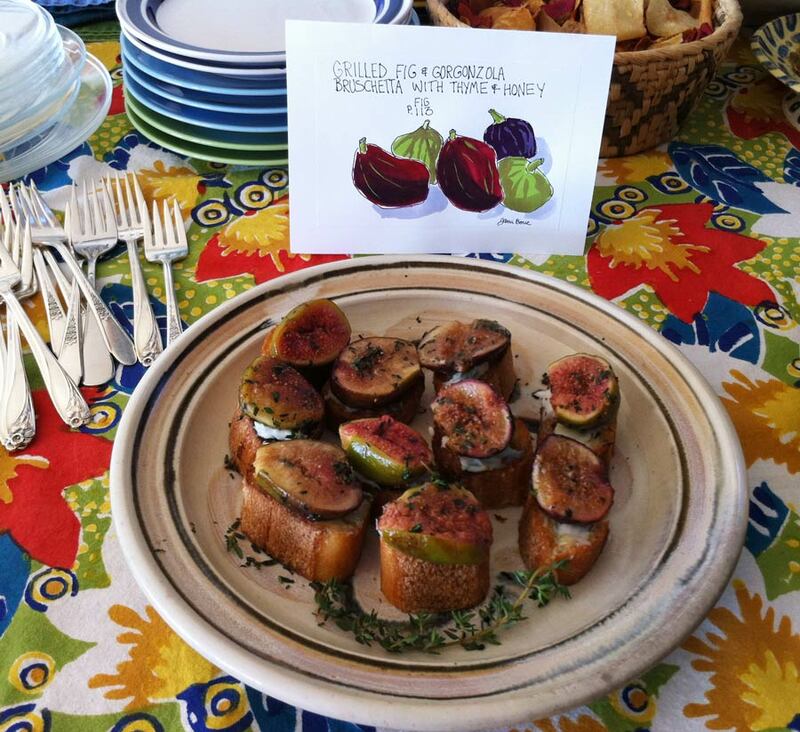 Grilled Fig Bruschetta table card, ink & gouache, 5x7"
At the book publication party for my friend Barbara’s wonderful new book, From Tree to Table: Growing Backyard Fruit Trees in the Pacific Maritime Climate I decided to make one of the recipes in the book: Grilled Fig Bruschetta. 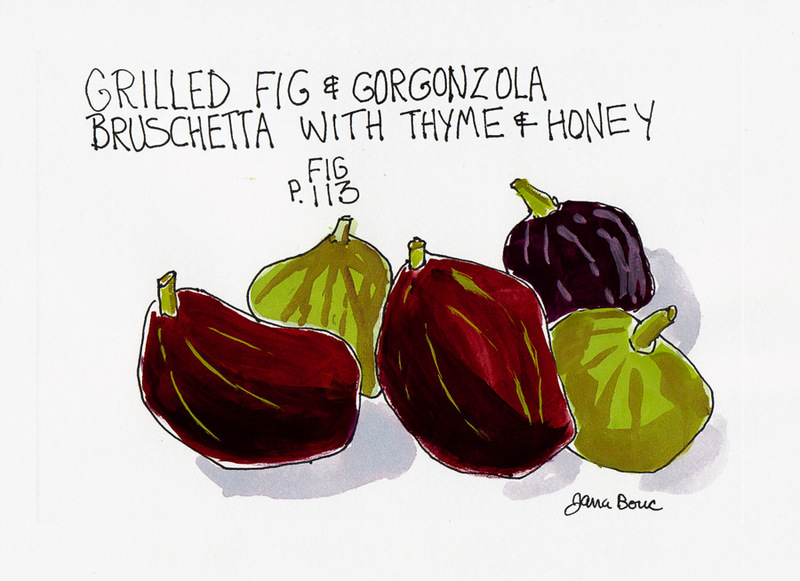 But first I sketched a few of the figs (above) before cooking them. I used a blank note card because I wanted to stand it on the table with the food. But since it wasn’t watercolor paper, the paint just sunk in. I switched to gouache which worked great and was huge fun. I’m not a confident cook, but the recipe sounded simple and very delicious: figs tossed in olive oil and fresh thyme and broiled, then set atop a toasted baguette spread with gorgonzola dolce cheese (soft, sweet blue cheese), and then drizzled with a bit of honey and a sprinkle of thyme. They were fabulous! A perfect combination of flavors and everyone loved them. I’m glad I took a picture (above) before they were all gone. I served them on plates I made many years ago when I was a potter. 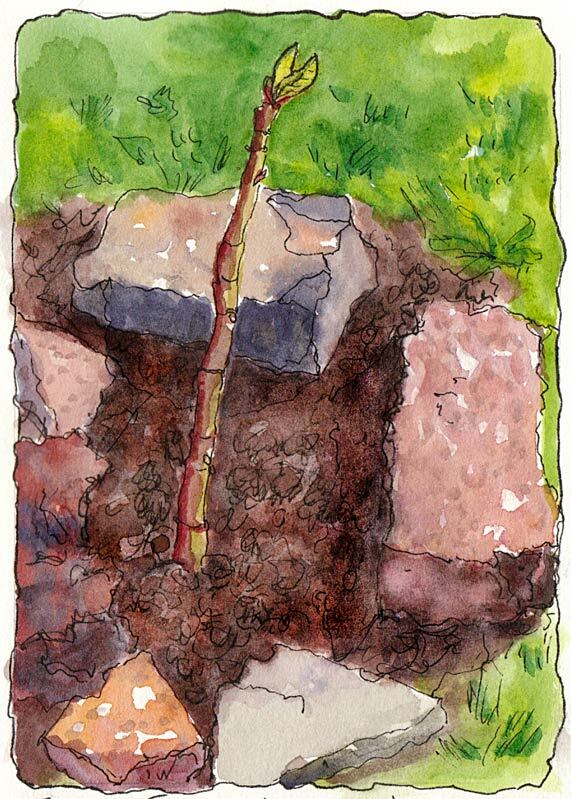 Baby Fig Tree Grows, ink & watercolor & stamp, 7x5"
This is the baby fig tree that Barbara gave me last spring. 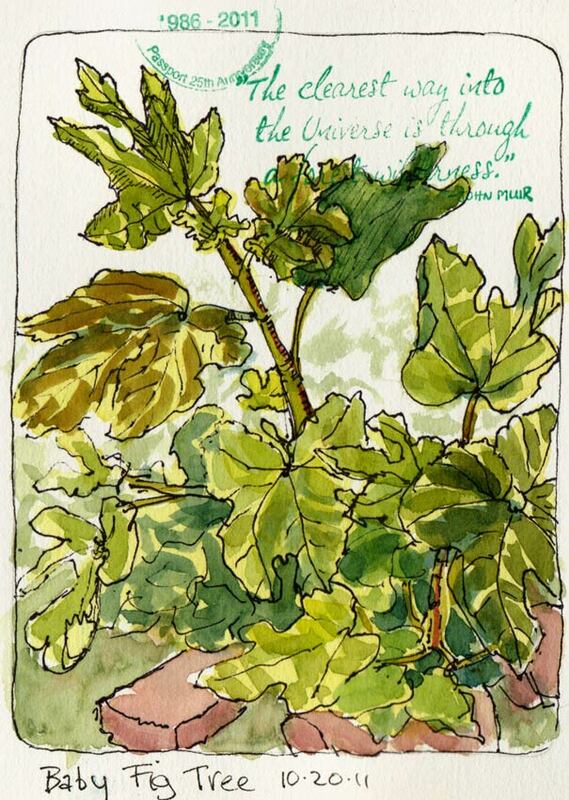 I’ve sketched its progress from stick, to growing three leaves to now (above) with three skinny trunks. I’m going to use the pruning section in From Tree to Table (and a little help from Barbara) to learn how to prune it so it just has one trunk, once it drops its leaves for the winter….if winter ever comes…we’re still having warm summer-like weather half the time and fruit trees are so confused.